“I’m not in the mood for fish tacos,” said NO ONE EVER. It’s true — fish tacos are the kind of meal that’s not only simple to throw together, but also universally loved by most. They also happen to be healthy, delicious and fun to make with friends or family. With so many preparations, flavor varieties, seasoning options and toppings to choose from, you can make a different type of fish taco every day and never go hungry (and never be bored). What Fish are Best for Fish Tacos? Fish that are firm yet flaky when cooked often work best in taco dishes. Wild salmon, halibut and cod are all excellent choices. They hold together nicely, but also flake when cooked so your taco will be moist and tender. These fish also happen to be loaded with essential nutrients including healthy omega-3 fatty acids, lean protein, selenium, B vitamins and vitamin D.
Fish Tacos can Actually be Really Healthy. Sure, fish tacos can be fried and smothered in sauce, but they can also be grilled or baked, or smothered in fresh vegetable slaw. There are tons of recipes that are actually low in calories and packed with flavor and healthy perks. And you can always cut back on some calories with your taco wrap — skip the flour tortilla and use a lettuce wrap or a corn tortilla, which has fewer calories, less fat and a lot more fiber. Taco lovers listen up: we’ve rounded up our most favorite fish taco recipes from around the web, because taco night should by no means be saved for Tuesdays. These tacos are a little bit spicy and perfectly crunchy. The fish is deep fried in oil, but the batter is light thanks to the addition of club soda to keep the coating airy and thin. It only takes about 5 minutes to fry the fish, and you’ll end up with a fish that is flaky and light but also indulgent and crisp. The avocado helps balance the heat of the jalapeños and hot sauce, and the slaw adds a nice extra crunch. Sometimes it’s best to keep things simple, and this fish taco recipe is simple but anything but basic. The cod (or halibut) loins are cut into 2-3 inch pieces and then coated in egg and a coconut flour/coconut flake mixture. The fish is then lightly fried in ghee (or butter) for a few minutes on each side. Once the fish is cooked, place on top of tortillas with arugula, avocado, lemon juice and cilantro and voila, dinner (or breakfast or lunch or snack) is served. As the name implies, this Cajun dish has some heat. The halibut is seasoned with a mixture of cayenne pepper, paprika, thyme, oregano and crushed fennel seeds, and then browned in a skillet before being baked in the oven. Once the fish is cooked you finish it off with some butter on top (yum) and serve it however your heart desires. You can eat it plain, it’s that good, or it makes a perfect fish to serve on tacos — it needs minimal garnish, maybe just a slice of fresh avocado to balance out the spice. 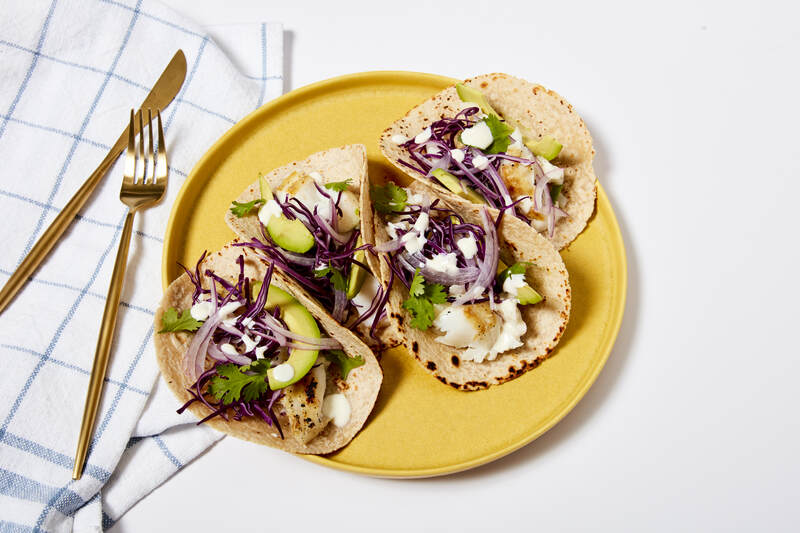 These halibut tacos are bursting with flavor thanks to the long marinade process — you cover the fish in the chimichurri sauce and let it chill for 2 hours. Once the fish is ready you cook it on a hot grill or grill pan, then break the cooked fish into chunks and serve on warm tortillas with your toppings of choice. Easy, simple, healthy, and mouth-watering good. While each part of these tacos is pretty delicious, the lime crema is what makes this recipe extra special. This creamy sauce perfectly tames the seasoned halibut, and the refreshing mango salsa adds another burst of flavor. While the recipe calls for homemade taco seasoning, store-bought is totally fine (and far more realistic for many of us). As if salmon wasn’t healthy enough, this recipe tops off the tacos with shredded cabbage, which is loaded with vitamins A and C and calcium, and with a tangy apple-cucumber salsa that adds a hearty dose of fiber. Plus the apple-cucumber flavors go perfectly with the chile seasoning. For a quick seasoning method, a dry rub offers maximum flavor with minimal time and effort. The salmon in these tacos is rubbed in a cumin-chili powder-brown sugar-coffee mixture and then grilled, for a healthy, light, but flavorful fish. The tomatillo-avocado slaw adds crunch and a bit of heat, which you can adjust to your taste. These roasted salmon tacos are light and good for you, but somehow still so indulgent. The key here is to make the cabbage slaw well in advance (at least an hour) to allow the flavors to infuse throughout the slaw. The salmon itself is seasoned and baked to perfection, but the avocado mash and the cabbage slaw really tie the whole taco together.